I was pretty much Linda in this episode... I totally felt like barfing at what was happening! 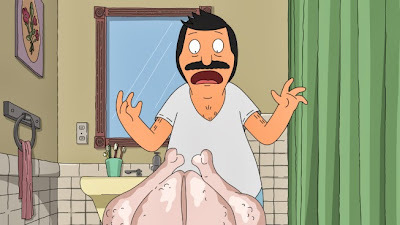 I couldn't understand how the turkey in the toilet was repeatedly happening, though the answer at the end of the episode was pretty cute, if not still partially disturbing. I did find it interesting that both Eve and Tina made cases to sit at the adults' Thanksgiving Dinner table this season, as that is a story that I don't remember seeing in the past. Everyone defaulting to Louise was also amusing, as was short-lived gag that Linda can't keep a secret. Oh! And I also hadn't realized (or maybe I had completely forgotten?) that Gail was Linda's SISTER... I always just thought they were BFFs. This made the song-and-dance number at the end much more exciting. A really heartwarming episode. Bob's Burgers is extremely well written and acted. "Full Bars", "O.T. : The Outside Toilet" and "My Big Fat Greek Bob" are my personal favs!